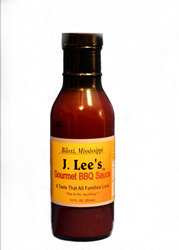 J. Lee’s Gourmet BBQ Sauce earned fourth place honors of over 500 entries, thus placing it in the top 1% at the 2014 National Barbecue Association Award of Excellence contest in the Barbecue Sauce-Fruit Mild category held in San Marcos, Texas. You can put this on anything! On March 6, 2014 at the National Barbecue Association’s Annual Conference & Trade Show Awards of Excellence Luncheon, the winners of the sauce competition were announced and the following week the top five winners in the 26 categories were posted online. J. Lee’s Gourmet BBQ Sauce, still a relatively new product with less than six month since its public release, surpassed several hundred other sauces to land fourth and placing it in the top one percent of entries nationwide in its first competition. The enormous versatility of J. Lee’s enabled it to be extremely competitive in the Fruit Mild category even though it does not consist of any fruit and or fruit concentrate ingredients. The fact that J. Lee’s unique flavor sets it far apart from traditional barbeque sauces is also the key to its great showing at the competition. The sauce’s richly sweet base, followed by a tangy twist, and then the slightest kick, leaves customers anxious to get J. Lee’s Gourmet BBQ Sauce home to try it on a variety of dishes. The sauce originated in Biloxi, on the Mississippi Gulf Coast but it has proven to be a hit everywhere The Sauce Team has taken it. While the sauce was in competition in San Marcos, Texas, The Sauce Team (TST) of James Lee, Founder; Ashante Vereen, Sales and Marketing Director; and Curtis Jennings Public Affairs Representative, took J. Lee’s Gourmet BBQ Sauce on the road to Redstone Arsenal Military Installation in Huntsville, Alabama. In 16 combined hours over the three days, 432 bottles were purchased. Customers purchased the sauce by the cases (6 bottles per case) as well as individually. Children and families loved the taste and routinely commented on the unique flavor and versatility, saying, “You can put this on anything”, just as it is written on the bottle. J. Lee’s autograph and picture were requested by numerous customers. He accommodated each one as they waited patiently in line to have their bottles signed. J. Lee’s Gourmet BBQ Sauce will continue to enter competitions and promote its unique taste across the nation. Bottles and cases can also be purchased online at http://www.jleessauce.com.